Growing up, my mother was a Stay-at-Home Mom for most of my childhood. She cooked, she sewed dance costumes and drove me long distances to dance classes nearly every evening. It all looked quite effortless to me. I don’t think it was the most rewarding work, but her mother had not been a Stay-at-Home Mom and she wanted to be there for my sister and I in our formative years. I appreciate the sentiment. When my first child was born, I had to go back to work after seven weeks of maternity leave. I will never forget how guilty I felt leaving my son with his ‘daycare mom’ that first day. I cried the full 45 minutes to my office and could hardly concentrate when I got there. Day-by-day it got easier, but I would have preferred to be home with my baby boy. 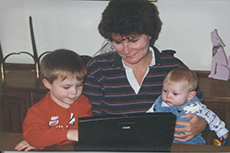 When my second son was born, I was fully engaged in my work, a virtual university start-up. I started that job when I was five months pregnant, actually asked for the job when I saw the opportunity to create and manage an online campus for the University of Colorado. My husband said I was crazy, I should just take my leave and forget about the office for a few months. But the work was compelling and worthwhile, and there really wasn’t any one else to do it. I had the knowledge and drive. So I worked from home as I needed to throughout my maternity leave to keep the project moving ahead and I delegated to a trusted employee the rest. I took my newborn to meetings a few times and prayed he’d sleep through, he mostly did. When we decided to adopt our daughter from China, I was determined to be a Stay-at-Home Mom. I reasoned, she’d been in an orphanage for the first eight months of her life, I need to give her devoted time for at least that long. I happily took on the role of Stay-at-Home Mom for several months and then eased back into part-time work with a supportive group of colleagues and work friends who had formed a consulting group. This felt like a good balance between continuing to grow and contribute professionally and being with my kids. What was the difference in each of these instances? For me, the sheer need to earn a pay check was a key driver. My desire to give staying-at-home a try was also a factor. Finally, my drive to work and the value I perceived in my work efforts also were an important factor. When I was less engaged with my job, it was actually quite easy to leave it behind, and the significant salary, to spend time with my child. No one can tell another the ‘right’ answer to this question. And it is a question that plagues Dads and well as Moms. It is important to give it the same thought and strategic process that you would a critical business decision. You can’t ever get the time back, regardless of how you spend it. It’s your choice.